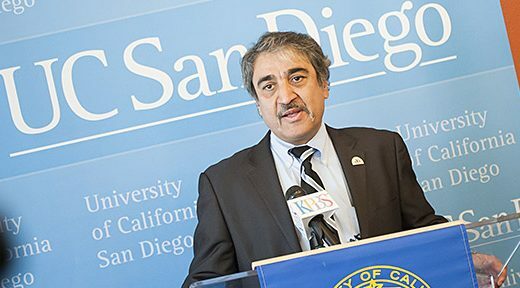 Pradeep K. Khosla, an internationally renowned electrical and computer engineer, is the eighth Chancellor of the University of California, San Diego, and a Distinguished Professor. At UC San Diego, he initiated and led a comprehensive, all-inclusive strategic planning process to unify the campus and define UC San Diego’s future. The initiative resulted in a Strategic Plan that outlines five overarching goals, four grand research themes, and 13 strategies to fulfill our sharpened mission and vision as a student-centered, research-focused, service-oriented public university. Khosla received his bachelor’s degree in electrical engineering from the Indian Institute of Technology – Kharagpur in 1980, and his MS and Ph.D. degrees in electrical and computer engineering in 1984 and 1986 at Carnegie Mellon. In 2014, he received an honorary doctorate of science from the Indian Institute of Technology – Kharagpur. The campus encompasses six undergraduate colleges, five academic divisions, and five graduate and professional schools. UC San Diego’s programmatic offerings – more than 130 academic degree programs – are both impressive and highly ranked, ranging from science, management, engineering and medicine to social science, international studies, and arts and humanities. In addition to its highly rated graduate research programs, UC San Diego offers professional degrees in medicine, management, pharmacology and pharmaceutical science, and international studies. Specialized campus resources include the San Diego Supercomputer Center; Qualcomm Institute for Telecommuications and Information Technology, the UC San Diego Division of Calit2; Center of Interdisciplinary Science for Art, Architecture, and Archaeology (CISA3); Center for Research in Computing and the Arts; Center for U.S.-Mexican Studies; Institute of the Americas; Institute on Global Conflict and Cooperation; and UC San Diego Extension. UC San Diego is the third largest employer in San Diego County with annual revenues of $4.3 billion in fiscal year 2014-15. UC San Diego enrolls more than 33,000 students, nearly 27,000 of whom are undergraduates. All incoming freshmen graduated in the top 10 percent of their high school graduating class. The exceptional quality of UC San Diego’s 1,900 Academic Senate faculty is reflected in the range of faculty honors among the campus faculty, including: Nobel Prize, Fields Medal, Balzan, National Medal of Science, Pulitzer Prize, Kyoto Prize, MacArthur Fellows (“genius award”), Tony Award, and Academy Award. UC San Diego’s research prowess has catapulted the campus to the top ranks of national and international academic standings. U.S. News & World Report ranks UC San Diego as the 8th best public university in the nation, and the National Science Foundation lists the campus 5th among top U.S. universities in total research and development expenditures for fiscal year 2013. UC San Diego is also ranked 1st in the nation by Washington Monthly, for six consecutive years, based on three criteria: social mobility, research and service. Khosla is an elected member of the National Academy of Engineering (NAE) and the American Society for Engineering Education (ASEE). He is a Fellow of the Institute of Electrical and Electronics Engineers (IEEE), the American Society of Mechanical Engineers (ASME), the American Association for Advancement of Science (AAAS), the American Association of Artificial Intelligence (AAAI) and the Indian Academy of Engineering. He is an Honorary Fellow of the Indian Academy of Science. His other awards include the 2012 Light of India Award, a Lifetime Achievement Award from the American Society of Mechanical Engineers, and the W. Wallace McDowell Award from the Institute of Electrical and Electronics Engineers Computer Society. In 2012, he was named as one of the 50 most influential Indian-Americans by SiliconIndia.